Better product-centric recommendations using SAS Customer Intelligence 360 was published on Customer Intelligence Blog. Do you know which of your customers have the most clout? It’s an interesting question, right? We all know our customers talk among themselves about our products and our brands. They do it in person, on the phone and on social media. Heck – even we marketers talk among ourselves and sometimes it's about our customers. It’s what people do – we’re social beings. And social beings have varying degrees of influence, or clout. Sometimes it’s because of expertise (think Warren Buffett), or credibility (think Oprah Winfrey), or having the moral high ground (think Mother Teresa), or sheer charisma (think President Clinton). In social media circles, folks with influence include Brian Solis and Scott Stratten to name a few. Sometimes its other factors like celebrity that drive clout (think Sofia Vergara or Ryan Gosling). But every community has its leaders, and they have clout simply because their followers listen to them and care about their opinions. Knowing that, I find it fascinating that a company like T-Mobile is able to discern which of its 45 million customers have clout. The funny thing is that number of customers is more than the entire combined populations of Canada and Sweden, yet T-Mobile is "just" the 4th largest wireless services provider in the United States. They have their sights set on growing to #1 and I can see that they have a fighting chance based on how they channel their marketing resources to the people who have the most clout by using Customer Link Analytics. 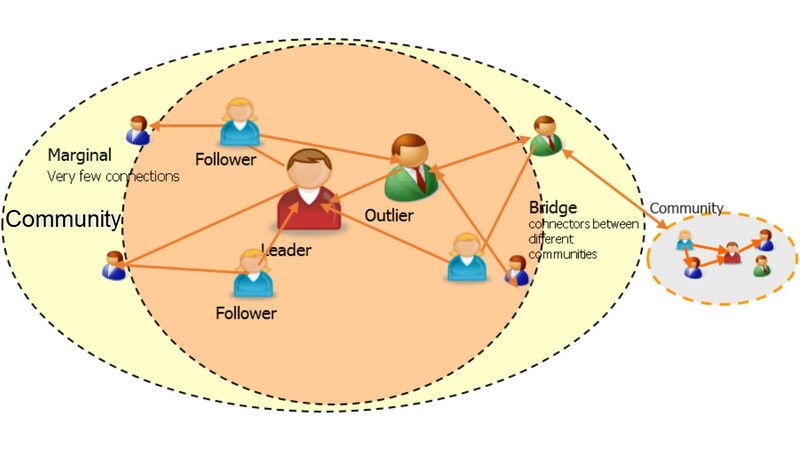 Customer Link Analytics is the study of interactions between customers to identify relevant customer communities as well as the importance of individuals within the community. 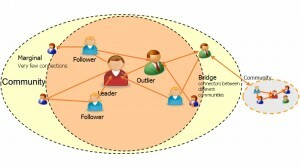 The customer links that comprise these social networks are often shown in diagrams as nodes (people) and lines (connections). It turns out that you can show the strength of connections mathematically. If you use the diagram, then the width of the line might show the strength of the connection. T-Mobile attracts influencers outside the network in the expectation that the community will follow. Also, they provide incentives to induce influencers to pull in off-network followers. They focus on influencers to help spread products up-take throughout the customer base. They’re able to reduce overall customer churn rates by creating effective loyalty programs tailored to identified influencers. For more details about this great story, you can tune in to the SAS-sponsored MarketingProfs webinar about T-Mobile using customer link analytics on Tuesday, November 19, 2013 at 1:00pm ET. It’s called “Kiss Churn Goodbye with Data-Driven Campaign Management." If you’re not able to catch it live, you can access the ondemand version afterward at sas.com – stay tuned for an update below with the new link. As always, thank you for following! There are many reasons I often feel overloaded and overstimulated nowadays, so I think I can relate to my target market when they get my messages. I'd like to take a moment to set aside my usual John-the-marketer hat and explore the issue of relevance from the perspective of my target – the customer. My fellow blogger, Deb Orton, wrote recently about how the digital marketing era requires a new definition of “best,” citing the many ways that our customers can (and do) tune us out. Is that a bad thing? As a customer, I don’t think so because I want to control what I get, when I get and and how I get it. Since I’m the customer I even get to determine the why of the communication, quite simply because I process the information under terms and conditions that make sense to me. And guess what? The tools of the digital marketing era we live in give me more control than ever, so I hear myself referred to as the “empowered customer.” Oooohhh, I’ll repeat that because it sounds so good to my ears – the Empowered Customer. And now, with social media, I get to voice my gripes and if my followers agree with me, my grumbling and grousing can sound like I’m ranting into a megaphone next to your ear. Are you listening? Can you afford not to? Are your employees empowered to respond? The point I am trying to make is that it is ever more important to strive for relevance as a goal for marketing. And it’s the customer that determines what is relevant – to them. So while it’s always been important to know your target market, the margin for error has become razor thin. Why? Because they can so easily tune you out and then broadcast your shortcomings if you don’t pay attention to what’s important to them. [warning – I am putting my marketer’s hat back on] The good news is that we also live in the era of the Empowered Marketer. Never before have we had so many tools to track, report and manage our campaigns. To create and share good content. To make the connections between the content and the desired result (sales). We have the ability to measure and know what our customers want – how they want it, when they want it. And if we’re really engaged with our customers we also know why they want it. Solutions to empower the marketer abound: Marketing Automation, Marketing Optimization, Customer Experience Analytics, Web Analytics, Social Media Analytics, Customer Link Analytics, Real-Time Decisioning . Those solutions empower the marketer to listen to their customer, understand them, anticipate their needs and plan the ways they can serve them. As empowered marketers, we have the power to achieve relevance – so let’s get to it! "Neighborhood Watch" – the Facebook community reports offensive web pages for a Facebook team to review and take action. Andrew is somewhat coy about #2, focusing instead on the self-policing of the community. In this post we will investigate some of the likely approaches used in step #2 which, particularly when combined with #1, could be very effective in countering cyber bullying. Use discovery and topic migration to stay on top of the problem. I’ll outline how this hybrid approach can be applied in the remainder of this post. Continue reading "Text analytics: how to capture the online bully"